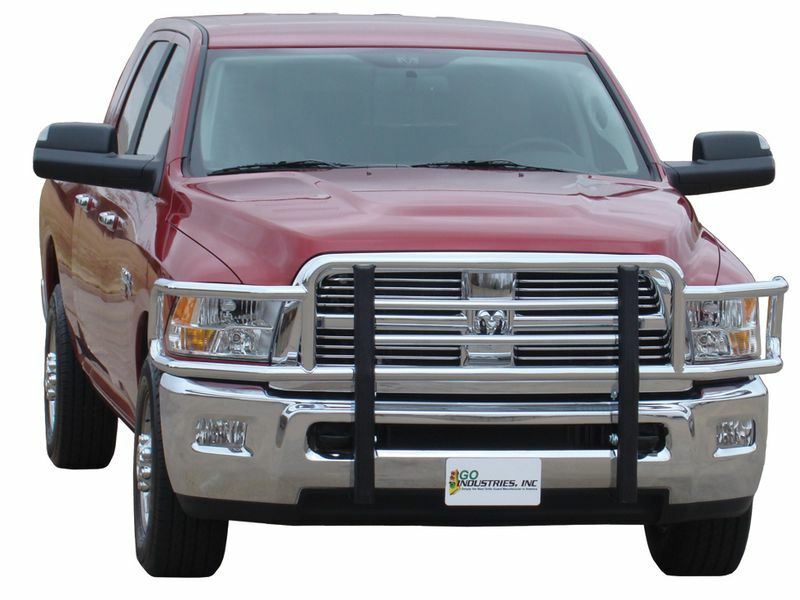 The Go Industries Big Tex™ grille guard is unlike anything else available in the pickup truck aftermarket business. A unique design and giant size tubes result in super stylish looks that won't bend, flex, or vibrate on the front end of your truck. Available in black powder coat and nickel chrome this front grill & brush guard has a look for every truck out there. Each Big Tex grille guard application features heavy-duty rubber push pads. Constructed of one piece tubular framing, using massive 1.9" 14-gauge steel, and this mega size truck grille guard will withstand the test of time. Heavy duty 11-gauge steel uprights offer maximum strength and a contoured fit as well as use of the factory tow hooks. Most applications for the Go Industries Big Tex Grille Guard feature easy, no-drill, frame mount application. Some Chevrolet & GMC grille guards are available in a low profile design and selection models are available in the Big Tex II design, which features no see welds. These truck grille guards are available for full size Chevy, Ford, Dodge, GMC and Toyota Trucks. SIX-YEAR WARRANTY – Chrome Big Tex Grille Guard™ (excluding exposed welds) are covered with six (6) years of protection; three (3) years 100% warranty on materials, workmanship and finish under normal use. The 4th, 5th, and 6th years of coverage require a payment of 50% of the replacement value. The replacement value is the manufacturer’s suggested retail price at the time of the original purchase. THREE-YEAR WARRANTY – Black Big Tex Grille Guard is covered by a three-year warranty on materials, workmanship, and finish under normal use. EXCLUSIONS FROM WARRANTY: The warranty of Go Industries does not extend to exposed welds, freight damage, damage to products caused by intentional misconduct, negligence, abuse, misuse, road hazards such as damage from gravel, rocks or other debris, modifications or alterations to the product, improper installation, uses of the product contrary to the product information sheet which accompanies the product, improper or inadequate maintenance (see Finish Protection above)and normal wear and tear. Painted fiberglass products may not be returned. The finish on the Rancher Grille Guard™ is free of paint scratches and chips when packaged. Minor paint scratches and chips caused by installation or transportation handling is not a warranty issue and cannot be returned. Go Industries will furnish touch up paint for minor scratches and the touch up will not harm the integrity of the product. This product offers an easy, at home no drill installation. The installation manual is clear cut and easy to read. For additional information, please call us toll free at 1-877-216-5446 or 701-253-5906.